Please sign the petition to Turner Entertainment/Warner Brothers to digitalize silent film actor Tom Tyler's surviving FBO silent films which are presently housed in American and European film archives. Turner Entertainment/Warner Bros. is the legal distributor of any FBO/RKO movies between 1925 and 1930. 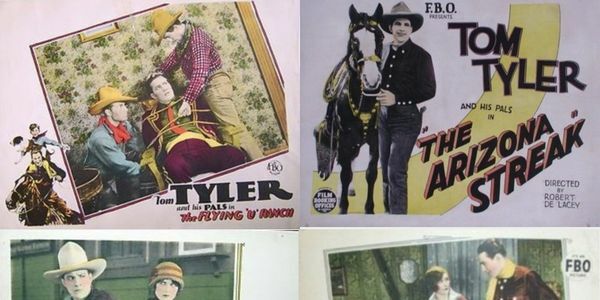 This is a petition for Turner Entertainment/Warner Bros. to digitalize the following Tom Tyler silent films he made for FBO between 1925 and 1929 and eventually make these movies available on DVD for consumer purchase. The Cinémathèque Royale de Belgique, EYE in Amsterdam, Gosfilmofond, and Filmoteca Catalunya have robust preservation, digitalization and restoration programs -and are willing to be part of this project. Silent film B-westerns play an important role in the history of early Hollywood as well as early twentieth century American popular culture. The appeal of Mr. Tyler's silent films were oriented primarily to youthful audiences during the 1920's and 1930's. These movies belong not just to the generations of those two decades, but to youth everywhere of all generations, including those young at heart. It is more vital in our popular culture than ever before for children to experience the creative imagination of what it was like to grow up playing cowboys, when cowboys were heroes, as Mr. Tyler portrayed heros onscreen during the silent film era. These silent films that Mr. Tyler made for FBO are worth being digitalized and available on the consumer market. Should anything happen to these film prints stored in their respective European film archives, a valuable part of Holywood history will be lost forever. In the event Turner Entertainment/Warner Brothers is for any reason unable to release the above mentioned Tom Tyler silent films on DVD even after digitalization is done then to please license these silent films to a DVD distributor for completion, although it is preferable for the copyright owners/RKO film library distributors to distribute these silent films on DVD in a package. It is my understanding through correspondence with RKO – the copyright owners of Tom Tyler's silent FBO films - that Turner Entertainment/Warner Bros. is the legal distributor of any FBO/RKO movies made between 1925 and 1930. I would like to request Turner Entertainment/Warner Bros. to consider digitalizing the following Tom Tyler silent films he made for FBO between 1925 and 1929 and eventually make these movies available on DVD for consumer purchase. These silent films are one that fans of B-westerns and silent film all over the world would like to see. The Cinémathèque Royale de Belgique has a steady preservation, digitalization and restoration program - and has collaborated with Warner Brothers previously in the restoration and digitalization of films held in their archives for DVD transferral and is willing to be part of this project. EYE in Amsterdam, The Netherlands, also expressed cooperation with this project. Silent film B-westerns play an important role in the history of early Hollywood as well as early twentieth century American popular culture. The appeal of Mr. Tyler's silent films were oriented primarily to youthful audiences during the 1920's and 1930's. These movies belong not just to the generations of those two decades, but to youth everywhere of all generations, including those young at heart. It is more vital in our popular culture than ever before for children to experience the creative imagination of what it was like to grow up playing cowboys, when cowboys were heroes, as Mr. Tyler portrayed heros onscreen during the silent film era. These silent films that Mr. Tyler made for FBO are worth being digitalized and available on the consumer market. Should anything happen to these film prints stored in their respective American and European film archives, a valuable part of Holywood history will be lost forever. Thank you for considering this petition.